More than three billion people worldwide depend on rice for nourishment. In the Philippines, about 10.9 million metric tons of rice were consumed in 2012 (PhilRice & PSA, 2013). On an average, a Filipino consumes 114 kg of rice per year. As a staple, rice is an important source of carbohydrates but not of some micronutrients, such as vitamin A. This contributes to hidden hunger or micronutrient malnutrition that affects 2 billion people globally. Hidden hunger can result in more frequent and severe illnesses and complications during pregnancy, childbirth, infancy, and childhood. Golden Rice is a new type of rice developed to contain beta carotene in its grain. This nutrient, similar to what is found in orange-colored fruits and vegetables, is converted to vitamin A as needed by the body. PhilRice is leading the development of Golden Rice in the Philippines in partnership with the International Rice Research Institute (IRRI). Vitamin A is an essential nutrient found in animal food products and breast milk. It can also be obtained from orange colored-fruits and vegetables that contain beta carotene, which is converted to vitamin A depending on body’s needs. Vitamin A is crucial for the visual system, body’s growth and development, and a healthy immune system. Lack of this nutrient in the diet results in a condition called vitamin A deficiency (VAD). VAD can also be caused by infections that reduce appetite or the body’s ability to absorb vitamin A. The World Health Organization (WHO) estimates that there are 190 million preschool children and 19 million pregnant women worldwide who are vitamin A-deficient. Children with VAD are more likely to suffer from poor health and premature death. This deficiency is also the leading cause of preventable blindness among children in developing countries. Each year, up to 500,000 children go blind as a result of this condition and half of them die within 12 months of going blind. In the Philippines, VAD remains a persistent public health problem. According to the most recent National Nutrition Survey conducted by the Department of Science and Technology – Food and Nutrition Research Institute (DOST-FNRI), the incidence of VAD among preschool children has increased from 15.2% in 2008 to 20.4% in 2013. This means that about 2.1 million children are vitamin A-deficient. While proven approaches to address VAD – food fortification, vitamin A capsule supplementation, promotion of optimal breastfeeding and complementary feeding, dietary diversification, and nutrition education – have made real successes, gaps still exist. Golden Rice, once available, is intended to be used in combination with these existing approaches to address VAD. Since rice is widely produced and consumed, it has a unique potential to reach many people including those who do not have reliable access to or cannot afford other sources of vitamin A. Golden Rice is a brainchild of Professor Ingo Potrykus, then of the Institute for Plant Sciences, Swiss Federal Institute of Technology, and of Professor Peter Beyer of the University of Freiburg, Germany. It is developed using genetic engineering technique – a modern biotechnology tool that allows the transfer of a specific trait from a certain organism to another (by adding the specific gene that carries the desired trait). This was after surveys of rice varieties around the world failed to identify a variety that contains significant amounts of beta carotene, which implied that conventional breeding programs could not be used to develop Golden Rice. Golden Rice was initially developed by adding genes from daffodil and a common soil bacterium. Later, a better version of Golden Rice was developed using a gene from maize (corn) and the same soil microorganism. This version has twenty times more beta carotene than the first. 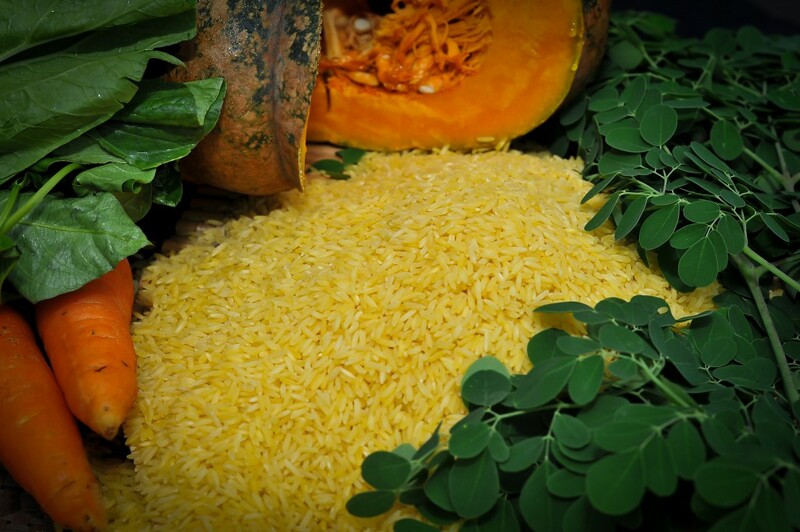 In 2004, the Golden Rice technology was donated to the Golden Rice Humanitarian Board, which transferred it to developing countries where VAD was prevalent, including the Philippines. In early 2017, PhilRice and IRRI have reached another milestone with the submission of an application to the Department of Agriculture-Bureau of Plant Industry (DA-BPI) for a biosafety permit for the direct use in food, feed, or for processing, of GR2E Golden Rice. Outside of the Philippines, applications for food or food and feed safety review of GR2E Golden Rice have been submitted to the US Food and Drug Administration, Food Standards Australia New Zealand, and to Health Canada. Collectively, the data presented in these application submissions have not identified potential health and safety concerns, and support the conclusion that food and/or livestock animal feed derived from provitamin A biofortified GR2E rice is as safe and nutritious as food or feed derived from conventional rice varieties. Detailed information on the product safety studies can be found here. The regulatory process under FSANZ was completed on 22 February 2018 with the publication of the Food Standards variance in the Commonwealth of Australia Gazette. In its notice of decision dated March 16, 2018, Health Canada declared that “changes made in this rice variety did not pose a greater risk to human health than rice varieties currently available on the Canadian market”, further noting that “GR2E would have no impact on allergies, and that there were no differences in the nutritional value of GR2E compared to other traditional rice varieties available for consumption except for increased levels of provitamin A. In the Philippines, the public information sheet on the proposal for direct use as food and feed, or for processing of provitamin A biofortified GR2E Golden Rice was published on 26 July 2017, marking the beginning of a 60-day public comment period. In coordination with IRRI, PhilRice led a series of briefings in Quezon City, Nueva Ecija, Isabela, Ilocos Norte, Agusan del Norte, Albay, Camarines Sur, and Tagaytay City. Different stakeholders, such as farmers, policy makers, students and teachers, research and development professionals, medical and health practitioners, and media and public information officers, including those from women’s groups and the religious sectors were briefed about the project from July to September 2017.